CaSToRC CoS516 Course Final Project: “High Performance Visualization for Large-Scale Scientific Data Analytics” submitted to the IEEE SciVis Contest 2015. Simulations of the formation of structure in the Universe typically simulate dark matter, a collisionless fluid, as a discretized set of particles that interact only gravitationally. Ensuring adequate mass resolution within a simulation requires a large number of particles — typically on the scale of 10243, 20483, or even 102403 particles in the largest simulations. Developing visualizations for these particles, and perhaps more challengingly for the structures that they form through gravitational interaction and collapse, requires first identifying the structures, developing spatial or informatics representations of the components or the structures themselves, and then correlating these visualizations across time steps. Typically, structures are identified through a semi-local process known as halo finding, wherein dark matter halos are identified either via local particle density estimation or through simple linking-length mechanisms. Within these halos, which may represent galaxies or clusters of galaxies, substructures are identified – within a galaxy cluster, smaller halos may be identified which correspond to the location of galaxies. As these structures and substructures interact, merge, separate and grow, the structure of the Universe grows and changes with it. Visualizing the transitions that simulated halos undergo during the lifetime of the Universe can provide necessary inputs to understanding observations from next generation telescopes. Datasets derived from the Dark Sky Simulations. As the size of data generated from numerical simulations continues to increase, visualization is now playing an increasingly more important role in assisting the scientists to obtain insight into the simulation output. To equip students with the ability to analyze very large-scale data sets, this course will provide an in-depth discussion of the state-of-the-art in large scale scientific visualization algorithms and systems. In addition to the fundamental visualization techniques, we will cover parallel implementation of selected algorithms for high-performance architectures such as the Blue Waters supercomputer. Students will get hands-on experience visualizing large-scale scientific data sets. This course will include video lectures, quizzes, and homework assignments and will provide students with free access to the Blue Waters supercomputer. The course is intended for graduate students in computer science or areas related to computational sciences who are interested in learning how to use visualization to analyze large-scale scientific data sets and also will be of interest to students who are considering scientific visualization as a research topic for their advanced studies. The instructor is Dr. Han-Wei Shen, professor of Computer Science and Engineering at the Ohio State University. A local instructor at the Cyprus Institute will be responsible for advising the local students and officially assigning grades. Students will complete the online course exams and exercises as part of their grade. 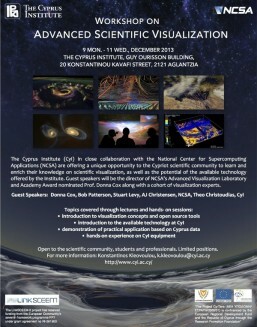 The Cyprus Institute (CyI) in close collaboration with the National Center for Supercomputing Applications (NCSA) are offering a unique opportunity to the Cypriot scientific community to learn and enrich their knowledge on scientific visualization, as well as the potential of the available technology offered by the Institute. Guest speakers will be the director of NCSA’s Advanced Visualization Laboratory (AVL) and Academy Award nominated Prof. Donna Cox along with a cohort of visualization experts. Open to the scientific community, students and professionals.